Homepage. This page: Parts purchase order for a 1926 10hp Car. 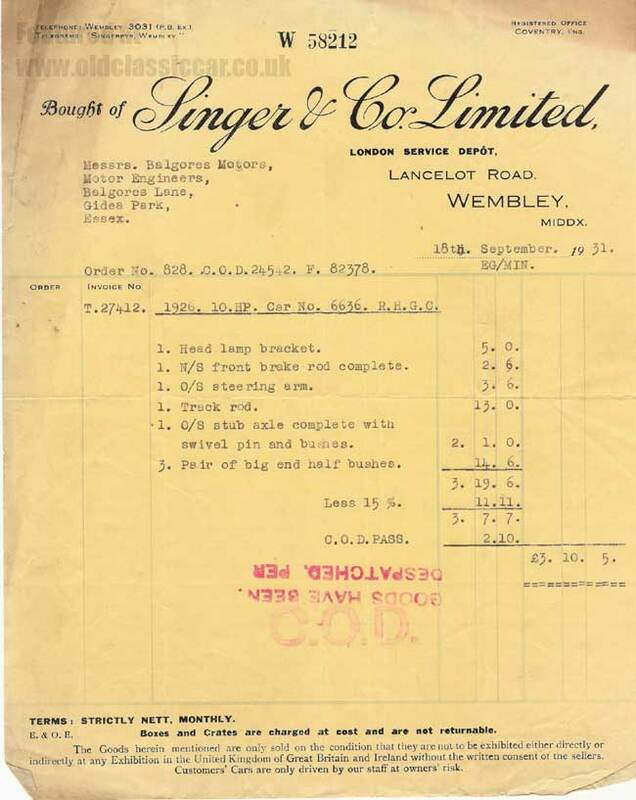 This elegantly headed invoice, dating to September 1931, was issued by Singer & Co. Limited, of Lancelot Road, Wembley, Middlesex, for a quantity of parts to fit a 1926 10 hp motorcar. Was 'Singer & Co.' just another parts supplier based in the South of England, or in fact the full name for the Singer motor car company?? perhaps someone who knows about vintage and post-vintage Singers could clarify this for me? This list of parts suggests that Balgores Motors were repairing a small 10 horse car following a minor bump, which may well have damaged the front corner steering and chassis components itemised above. I'm sure that car no. 6636 has long since been consigned to the melting pot, but if by a miracle this particular vintage Singer is still around, I'd be fascinated to see a picture of it.